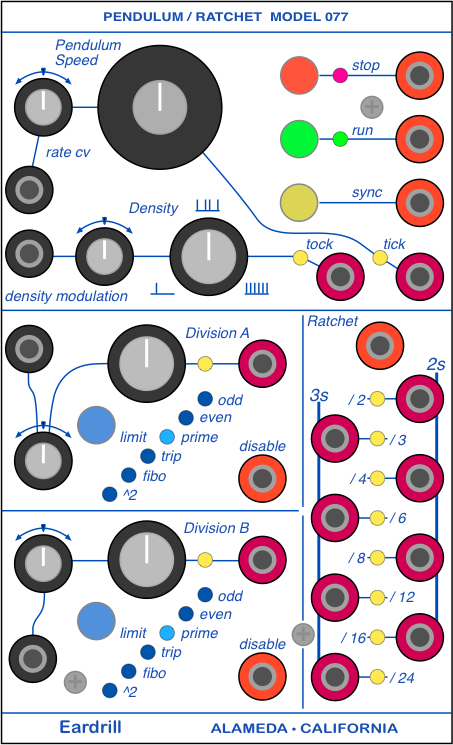 I always though that my Buchla system would benefit from a dedicated module to generate a bunch of correlated pulses. Sure, you can use sequencers and function generators for this sort of thing, but having a clock source generating a wide variety of pulses of different flavors was very appealing to me, so to that end, I came up with the Pendulum/Ratchet. The main clock rate goes from about eight and a half seconds per tick up to 10 ms per tick. These do the obvious things to the clock. Sync does one non-obvious thing, though. In addition to syncing the clock, it also resets all the divisors. With the Density control all the way up, the "tock" output is the same as the "tick" output. Turning Density down creates a pulse train that randomly picks pulses from the clock to send out the tock output. can be clocked from an independent source, although it will still listen to the sync jack as noted above. Either the tick jack or the tock jack can reach the Ratchet in jack with a shorting plug. Divisors that include common note values (2s column) and triplet values (3s column).